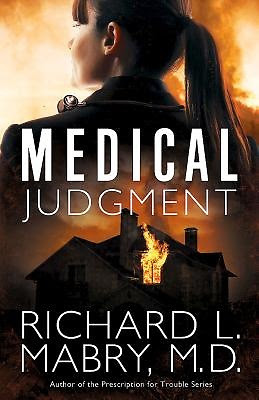 I have read a few books by Richard L. Mabry, M.D., so I jumped at the chance to review Medical Judgment. That was definitely the right decision. Like everything Dr. Mabry writes, there is a pretty strong medical connection -- this has been called a medical drama after all. In this case, the main character is an emergency room doctor. A fair amount of the story takes place in the ER, but certainly not everything. One of the things I love the most in this book is that while there is a bit of romantic tension, this is absolutely not a "medical romance" book. It involves people who feel real. People who go to work, which sometimes is drudgery. People who go to church. People who have made some big mistakes in life. People who you can imagine going grocery shopping, or standing in line at the post office. Of course, there are some pretty major things going on. I don't know about you, but I can't think of anyone in my circle of friends and acquaintances who has someone trying to kill them. That's not exactly normal. I can think of quite a few people who have faced some big losses though, and that is a pretty big topic in this book. Sarah's husband and baby daughter were killed a year or so ago. Another character lost his wife to cancer not too long ago. Yet another lost his fiancée, though I can't recall how. All three grieve differently, and there is some great discussion about how grief is going to be different for everyone. That was something I really appreciated in this story. That sounds pretty depressing, but this book is definitely not that. I loved it, and it kept me turning the pages. I felt a lot like Sarah, unsure of just who I could trust. Oh nuts that I missed the giveaway! Thank you for this review! I have enjoyed Mabry's medical novels in the past. I did not know he had another one out. I will be adding this one to my want to read list!